Following the unveiling of the first of its fleet of custom-built $1.3 million vehicles in Times Square today, tickets are now on sale for THE RIDE, a spectacular new immersive and interactive entertainment experience that moves guests through midtown Manhattan, as an ever-changing show featuring actors, performers, and everyday citizens unfolds on the streets before them. THE RIDE features vehicles so extensively equipped with advanced technology and other amenities that they had to be super-sized: they’re the largest allowed by law on the streets of New York and guaranteed to turn heads. Performers aboard THE RIDE – and posted along its 4.2-mile route – hail from the world of stand-up and improvisational comedy, ensuring a uniquely hilarious experience every trip, as they comment on New York’s history, iconic sites, and street life. Some of the fun for riders is figuring out what’s part of the show and what’s everyday life in New York City, as THE RIDE provides a wry, satirical and loving look at the city in all its glory. Created by Brooklyn-based director and entertainment entrepreneur Michael Counts, THE RIDE features a script by award-winning comedy-writer and producer John Bobey, who also serves as director, and veteran comedy-writers Kim Gamble and Jack Helmuth. 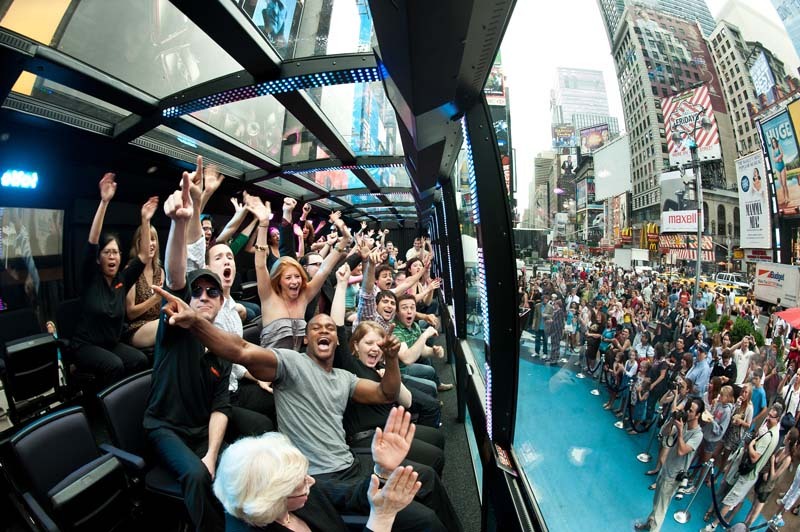 Each of THE RIDE’s vehicles is specially designed with more than 3,000 LED lights, 40 video screens, an IMAX Theater’s worth of audio equipment, cutting-edge wireless and directional speakers to connect with sidewalk performers and “floor-shaker” sound system technology that emulates everything from passing subway to a thumping nightclub. Three rows of stadium-style seating – facing the vehicle’s floor-to-ceiling side windows – orient riders to view the streets of Manhattan as if they were the biggest, most elaborate sets in the world.